I recently thought up a spatializer for Lunetta circuits based on the CD4052 analog mux chip and I'd like to share it with you. I coded it in ChucK software form and it worked fine, then just now I worked out a simple way to do it with the real chip and external resistors. Here's how it works. First an introduction to the CD4052 chip. See the attached datasheet for reference. There are three control inputs: A, B, and INHIBIT, which control the outputs of two four-bit analog multiplexor switches, labeled X and Y with inputs 0X, 1X, 2X, 2X, 0Y, 1Y, 2Y, and 3Y. A and B select the numbered X input that gets routed to the X output and also the numbered Y input that gets routed to the Y output. INHIBIT tristates the outputs X and Y. How we will accomplish spatialization is to create a voltage divider made of three equal valued resistors. Connect the input to 0X, a resistor from 0X to 1X, another resistor from 1X to 2X and the third resistor from 2X to 3X, plus connect 3X to ground. now use wires to reverse the input order for the Y inputs so that 0X connects to 3Y, 1X connects to 2Y, 2X connects to 1Y, and 3X connects to 0Y. Disable the INHIBIT feature by grounding the INHIBIT input, and connect two digital signals to A and B. Connect the left stereo output buffer to the X output and the right stereo output buffer to the Y output. A signal divider that produces input voltage levels of Vin, 2/3*Vin, 1/3*Vin, and 0*Vin. We then hooked these up to X and reversed them for Y. This creates the output signal pairs of (left, right) = (1, 0) or (2/3, 1/3) or (1/3, 2/3) or (0, 1) times Vin. This is a simple form of audio spatialization, with the A and B inputs selecting where the spatialized audio will appear to be. That's all there is to it, just use high valued resistors like 100k Ohms so the source driver will appear to be low impedance and use a high impedance audio buffer on the output such as an opoamp voltage follower. Having low source impedance and high load impedance will help the accuracy of the voltage divider. If you experiment with this circuit and learn more about it or figure out other ways to accomplish electrically controlled spatialization in Lunetta form, I invite you to report your findings here in this thread. Enjoy! Here, I drew a schematic in Eagle. Hope I did it correctly! I'll try breadboarding it up when I get back home in a few days. Cool stuff. I want to do something like this in the future. I have a juno-106, and it has 2 outputs but it is just the same mono signal on both outputs. I want to add an effect box to the output to allow panning effects. I'll keep this in mind and test it out when I finally finish my other projects and get around to that one. this looks like a very interesting idea. do you have any sound samples? what are pins 9 and 10 of the 4052 actually connected to [referred to as 'Stereo position selection B' and 'Stereo position selection A' on the schematic]? Hi folks, thanks for your replies. I have only constructed the circuit in software form so far, so it is a bit untested. Hmm, maybe I will build it tonight perhaps. I'm looking for something to do once things calm down a bit in chat and people go to sleep. The A and B inputs are the spatial location selectors. The value BA = 00 selects one side and BA = 11 selects the other side. BA= 01 and BA = 10 select the middle positions. Depending on what you want to accomplish with your Lunetta, you would drive BA with two bits that do the selection. So you could sweep left to right in four steps or right to left or maybe put some crazy mixed up signals that change every few tempos into those inputs to get some bounce-around spatialization. This definitely sounds like it could have some great applications, I shall add a 4052 to my shopping list. First the Karplus-Strong Percussion thing, and now this... Mr. Inventor, you da man! So I built this, and it's pretty fun to use 2 oscillators to drive the A & B inputs, for crazy bouncing spatialization... I only tried it using the KS perc circuit as input so far, but I'm sure it will be good for other Lunetta stuff. My schematic-reading skills are not all that great, and I had a lot of trouble with this one... everything seems to be connected to everything else! So I ended up following the text description, which was quite clear. Thanks for sharing this cool circuit! RingMad, coolness! You are the first to experimentally verify this circuit, congratulations! I never thought about that, that for those who are not familiar with reading circuit diagrams - the text description may be very helpful. I'll try to include both in the future. Well done! OK, perhaps this is interesting to someone... if I can figure out how to attach these examples... I did a little demo using a tone generator putting out a fixed frequency. Perhaps it's just illusion, but the spatializer seems to affect the tone. 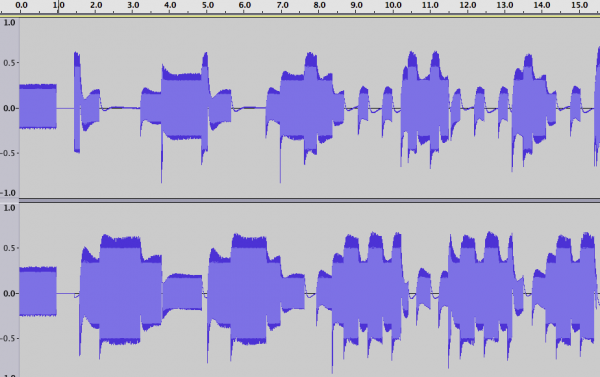 The waveform just shows a bit of what the recording looks like... the first second is the original tone, and then the following stuff is what the spatializer does with it. In the audio file, the first 2 seconds are the original tone, and then the spatializer kicks in at slow clock rates, then i start tweaking them to go faster later on.